Stop in to K&F Auto Sales and Service LLC to snag your March savings today! Now through April 30th, 2019 we are offering 2 sales! YES 2!! 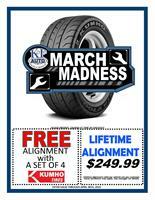 - FREE alignment with a set of 4 Kumho Tires. - Lifetime alignment for $249.99. Please present coupon at time of checkout. Lifetime aligment is nontransferable through change of ownership (Any vehicle sold).